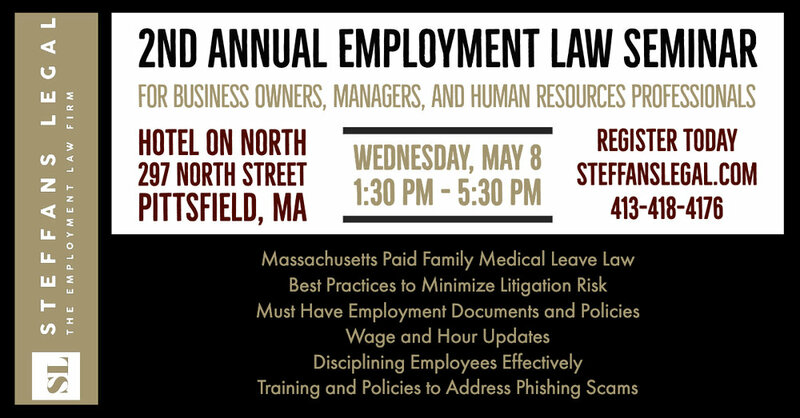 If you are a business owner, manager, or human resources professional, spend the afternoon with us as we keep you up-to-date on today's hot button employment law issues. This seminar promises to be full of helpful information. Come with your questions and get them answered. We will be providing snacks and cocktails at the end of the seminar. Elliot, as always, will make an appearance. Thank you for registering. We look forward to seeing you May 8th! If you have any questions please contact us at 413-418-4176 or email vmistry@steffanslegal.com.